(Spanish American War Patriotic) Cuban Waving Flag with "Patria Y Libertad., Viva Cuba Libre!" 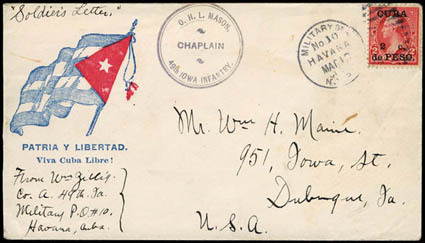 Slogan, light blue and red patriotic design on cover bearing Cuba 2c on 2¢ reddish carmine (222) tied by "Military Sta. No. 10, Havana, Mar 10 1899" duplex to Dubuque Iowa, sharp "O.H.L. Mason, 49th Iowa Infantry. Chaplain" circular handstamp, endorsed "Soldier's Letter" and "From Wm Gillis, Co. A. 49h Ia., Military P.O. #10, Havana, Cuba. ", Dubuque (3.24) arrival backstamp, Very Fine and attractive. 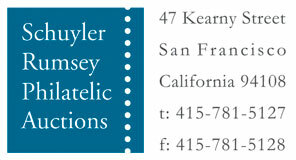 A link back to Sale 75 - Lot 174, along with its description, will be appended to your message.